Ancient Egypt Amun was a Theban god of no more than local importance. However, as the princess of Thebes conquered their rival claimants to the rule of Egypt, Thebes was made the new capital of the country, their God Amun became a chief worshipping deity in Upper Egypt. In ancient Egypt, Amun was the prominent God until Amun was combined with the sun God Ra, thus becoming Amun-Ra. 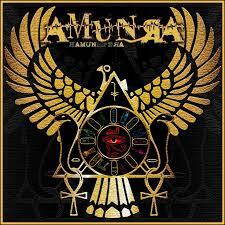 The name Amun Ra meaning is the God who is ultimate, powerful God. Amun-Ra was considered as “King of Gods” and its importance grew spiritually and politically to such an extent that Egypt became something of a Theocracy. By the time of the New Kingdom Amun Ra was at the apex of his worship, Egyptian religion approached monotheism. The other gods were just manifestations of Amun-Ra or mere symbols of his power. In deep essence, he became the one and only chief supreme deity. Amun was originally depicted as a goose and given the epithet “Great Cackler” (like Geb). But as per Egyptian mythology, he was also associated with a number of animals, whose form he sometimes took in inscriptions. It was also believed that Amun could regenerate himself by shedding his skin and becoming a snake. However, Amun-Ra was most frequently associated with the Ram, a symbol of fertility. Many times, he is also depicted as a man with the head of a ram, a Frog, a crocodile, an ape or a Uraeus (royal cobra). 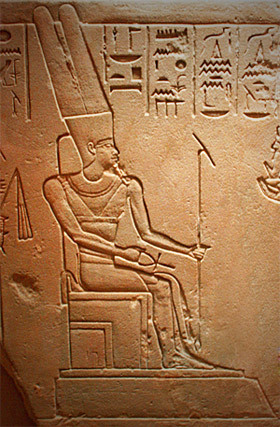 His typical depiction is that of a king sitting on his throne wearing the two plumes crown (also associated with Min). Ancient Egyptians called Amun-Ra as the vizier of the poor. It was said that he was an upholder of justice and he protected the weak from the strong. Those who wished favors from Amon were either required to demonstrate their worthiness or to confess their sins first. It is said that the sacred animal of Amun was originally the Goose and was sometimes known as the “Great Cackler”. As Ram was a symbol of fertility, Amun was more closely associated with the Ram and worshiped as a fertility deity. However, at various times he also appears as a man with the head of a Frog, the head of a crocodile, or as an app or the head of a uraeus. Amunet is sometimes also spelled as Amonet, Amaunet, Amentet, Amentit, Imentet, Imentit, and Ament. Amunet was primarily known as the goddess of the air and invisibility. It’s personification changed over the duration of the dynasties of Egypt. It is believed that Amunet is the female form of the greater god Amun. She is one of the eight featured deities in the Ogdoad that consists of four pairs where the woman’s name is a derivative of that of the husband. Originally, Amunet is a snake goddess and represents a class of primordial nature. Like most of the Ogdoad goddesses, Amunet takes the form of a woman with the head of an Egyptian cobra, or simply just a regular snake. In classical terms, Amaunet is a snake-headed woman goddess of an androgynous character. The name “Amun” means “hidden”, that which is invisible to the naked eye. And Amunet means a female who is hidden. It is said that her powers are connected to the words reflecting silence, mystery, stillness, and obscurity. The Book of Amun-Ra was an Ancient Egyptian book that contained ancient spells and incantations which could take life away from mortals and was made of pure gold. Colloquially known as “the Book of the Living” or “the Golden Book”. To keep it safe, the ancient Egyptians kept the Book inside a statue of Horus at Hamunaptra, where it was declared forbidden to use. The book of gold was sacred and was fashioned in a way that only one with a “key” might open it. Indeed, the Book had a small puzzle-box-like object. This object when opened, acted as the key with which to open the Book. Thus it was safeguarded from the interference of unworthy men.